A new way to use your ATI graphics card. Now you can use your component video input device, such as a High Definition TV (HDTV), as your display with ATI's HDTV Component Video Adapter. Provides a big screen experience for your entertainment PC that is ideal for gaming, surfing the Internet, watching DVDs and more. Watch TV, play video games, watch DVDs, and even surf the et! The HDTV Component Video Adapter provides the highest quality, lowest cost method to deliver component output to your HDTV or component video display. With both progressive and interlaced formats supported in 480i, 480p, 720p and 1080i, you can get a sharp image on any component video display. * Works with any analog component (YPrPb) input device such as projectors, HDTVs, etc. 1. Set switch 3 to OFF. 540p currently not supported. 2. Set ALL DIP switches to ON that correspond to the modes that your Component Input Device supports. Please consult your Component Input Device manuals for more details. 3. 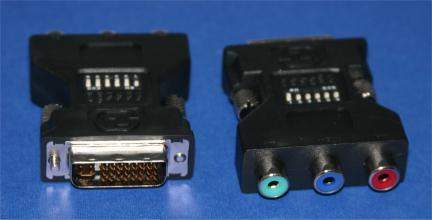 For example, if your Component Input Device supports 480i, 720p and 1080i, set switches 1, 4 and 5 to ON (see below). 4. Aspect Ratio: If your Component Input Device also supports 16:9 Aspect Ratio, set switch 6 to ON. When switch 6 is set to OFF, the Aspect Ratio supported is 4:3. Note: Please go to Widows Control Panel to select the mode and screen resolution that provides the best result.